an eastern screech owl Megascops asio. From the fact that these species are owls which emit screeching calls. 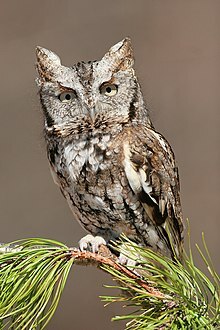 Any North American owl of genus Megascops. (Britain) A barn owl, of species Tyto alba. A particular small North American owl.